In order to support and educate children birth to age five, it is necessary to have a thorough understanding of how a child develops. All children experience a developmental journey but the pace at which children experience this journey can vary from child to child. Being equipped and empowered with this developmental knowledge can positively affect the way you support, communicate, and play with young children. In this course, you will not only learn the difference between physical, social-emotional, and cognitive development, but you will also learn about significant developmental milestones to be aware of so you can have realistic expectations and interact with children in developmentally appropriate ways. You will also be able to communicate this child development information to help educate families and others you serve. Define physical, social-emotional, and cognitive development. 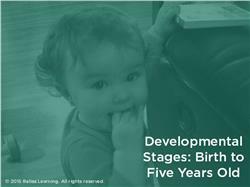 Identify specific developmental milestones from birth through age five in the three categories of development. Identify behavior that is developmentally appropriate for children birth through age five.